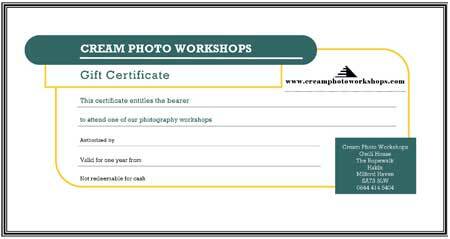 Cream Photo Workshops Gift Vouchers make a fantastic present for anyone who enjoys photography and shows the recipient just how thoughtful you have been in choosing their special present. Gift Vouchers are presented in a clear plastic wallet that is easy to wrap in gift paper. Enclosed with the Gift Voucher is a letter that directs the Recipient to our website and lets the holder know they can use their Gift Voucher towards any of our Photography Courses. You can buy a Gift Voucher directly from this page for the fixed amounts shown or you can choose a different value of money for a Gift Voucher by phoning our Customer Services on 0844 414 5404 and we will be delighted to help. We can take payments from most major debit/credit cards on 0844 414 5404 9am till 7pm, 7 days a week. All Gift Vouchers are dispatched by First Class Royal Mail. We look forward to speaking to you soon. Gift Vouchers for Camera Lessons - what a lovely idea! If you require multiple Gift Vouchers for the same value you can do this when you are taken to the PayPal 'Your Order Summary' page, where you need to enter the number of Gift Vouchers required in the Quantity box then click on Update to calculate the total amount.